ArenaNet has launched a big update for Guild Wars 2, delivering its first chunk of non-raid-focused content since Heart of Thorns’ launch last October. Out of the Shadows kicks off season 3 of GW2’s Living World with a new zone, new storyline arc, and new instanced areas for PvP and PvE. 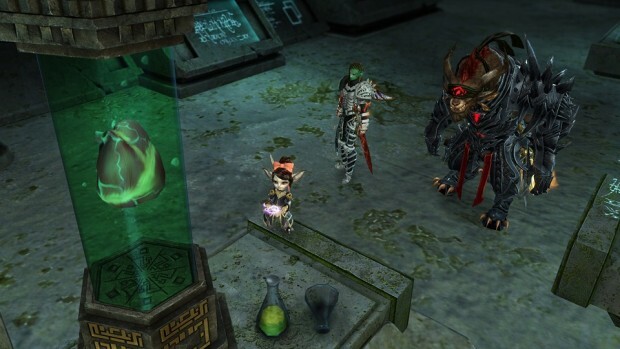 Players celebrate the defeat of Mordremoth while mourning fallen comrades and investigating a new threat lurking in the Maguuma Jungle following the elder dragon’s defeat. In addition to the new story content, there’s a new PvP map, Revenge of the Capricorn, done in the style of the old Lion’s Arch, as seen in the first two years of the game. Also, a new entry in the Fractals of the Mists, Chaos Isles, sends players on an adventure through a jumbled mess of previous Fractal levels and introduces a new and mysterious enemy. The update is free to players who have purchased Heart of Thorns and who log into Guild Wars 2 while the current episode is active, a period of time which should last for a couple of months. There’s still time to get the expansion at 50% off, but that sale expires on Wednesday the 27th, so act quickly if you want to get in on the bargain deal.